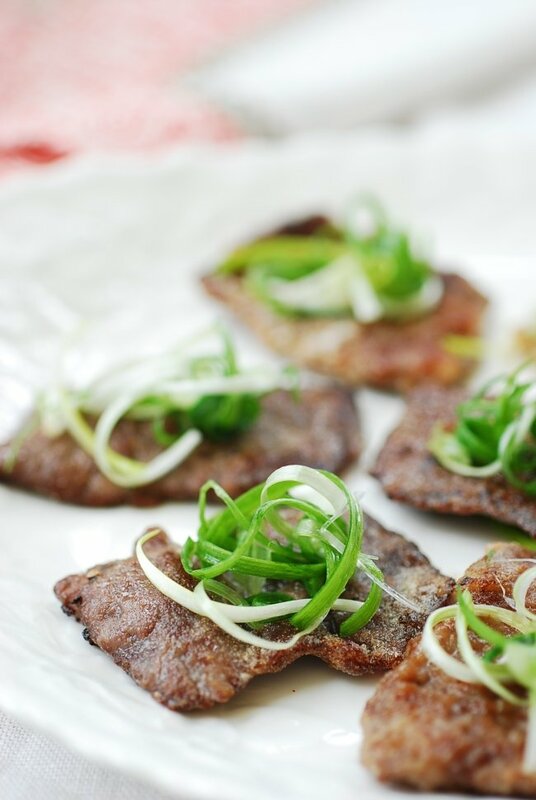 Yukjeon (육전) is a type of jeon (pan-fried battered food) that’s made with thinly sliced beef. It’s a traditional holiday or special occasion dish. A Korean feast always includes a variety of jeon dishes. 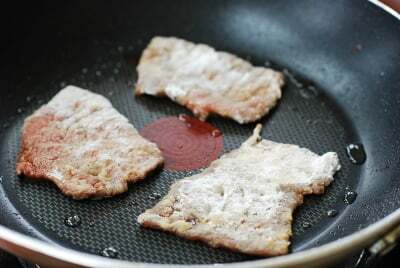 Yukjeon is commonly pan-fried in egg batter. 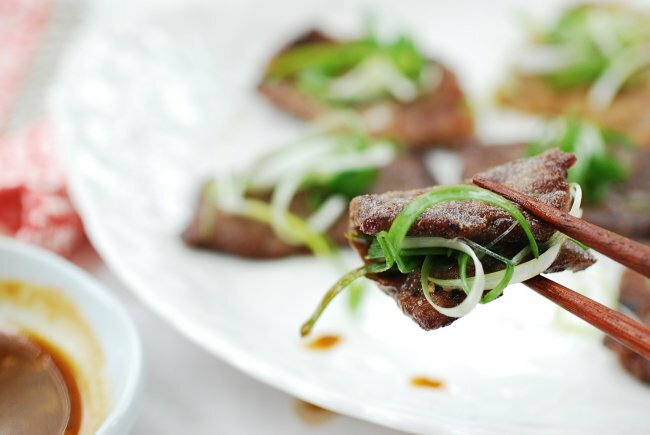 But, in this recipe, I simply dredged them in sweet rice flour to create a thin skin. I had this no-egg version as part of a course meal at a couple of restaurants in Korea last fall. I thought it was a nice change from the typical egg-battered ones. I think the beef flavor stands out better without the egg. 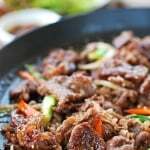 You can use pre-sliced bulgogi meat, but make sure it’s not too thin or fatty. 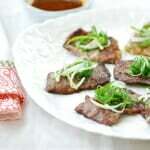 I marinated the beef slices in a soy-based sauce, but you can simply sprinkle with salt and pepper to season. 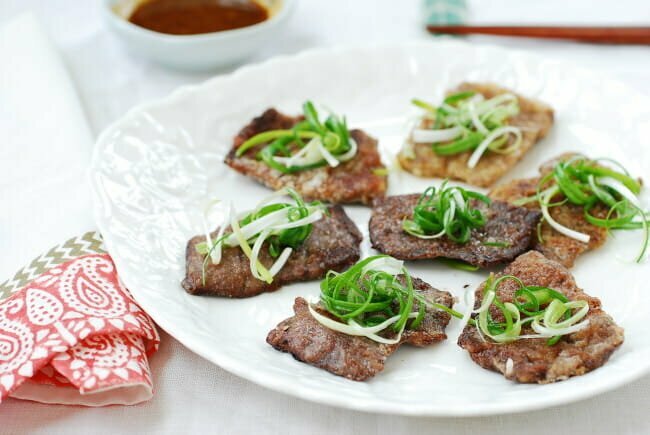 It’s an excellent first course dish if you’re planning on a romantic Korean meal for the valentine’s day. 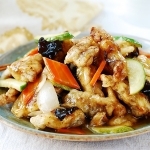 Or enjoy as part of your Lunar New Year feast that will be February 19 this year. 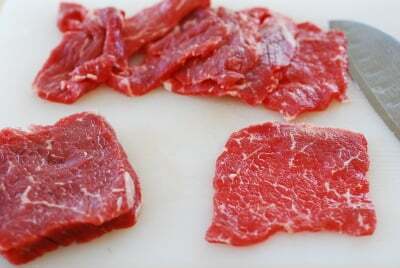 Thinly slice the beef if it’s not pre-cut. Partially freeze the meat for about an hour to firm it up for easier slicing. Lightly season both sides with the marinade, and let it stand for 20 minutes. 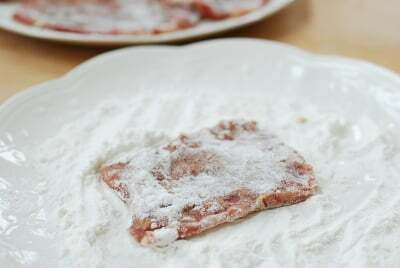 Dredge both sides of the beef slice in sweet rice flour, one piece at a time. Let it stand for a few minutes until the flour absorbs the marinade. Then, dredge again in the sweet rice flour to create a nice coating. Heat a large non-stick skillet over medium low heat. Add a tablespoon of oil. Place in the skillet. 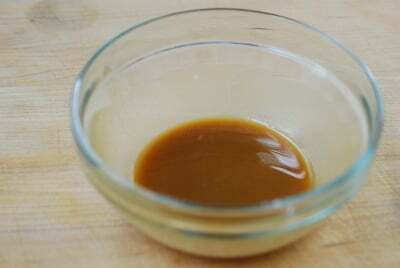 Cook for 1 to 2 minutes on each side, adding more oil if needed, until lightly golden. Repeat until all the beef slices are pan fried. 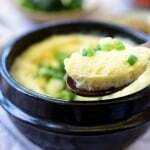 Serve warm with a dipping sauce. 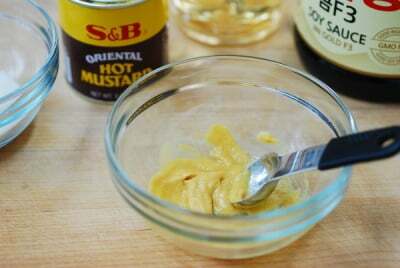 Mix the hot mustard in hot water. Let it stand for a few minutes for the flavor to develop. This step is very important, or the mustard sauce will taste bitter. 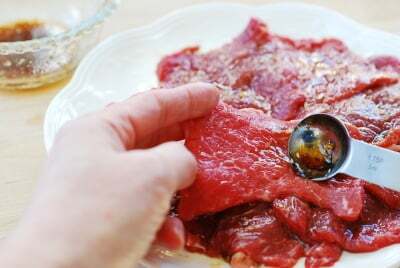 Mix int the other ingredients, and serve as a dipping sauce. Is the chapssal garu / sweet rice flour same thing as mochiko flour? Just wondering if I can substitute. They are the same things – Chapssal garu/sweet rice flour/mochiko. Your food always looks so beautiful and delicious. I wish I could make more of your recipes but I eat a vegetarian diet. I love coming to your site to look at your beautiful photos though. Keep up the good work! Thank you so much for the nice words. There are a quite a few vegetarian recipes. Hope you find some you like. 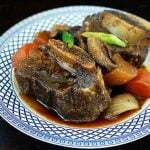 You do have quite a lot of vegetarian recipes and I’ve made many of them to great results. We make your Dubu Jorim once a week and if I skip a week, my two little boys sweetly demand them for their lunch box the next week. We all love it. Your Gamja Jorim is also a favorite. 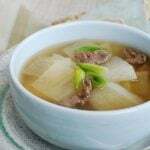 Your Doenjang Guk recipes work very well with a good vegetarian stock since doenjang is so wonderfully tasty and flavorful. We love your eggplant stir-fry and I even adapted the sauce to go with steamed shishito peppers that turned out super delicious. We always have your bibimbap sauce on hand to turn bits and pieces of vegetables left over at the end of the week into a quick and satisfying meal. Your egg dishes are pretty awesome too. I also made your Mak Kimchi and I have Korean radish waiting in the fridge to make your Kkakdugi. The list goes on and on. 🙂 I have built up an implicit trust in your recipes over time. 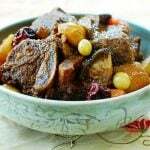 I am in a situation where I am not able to cook my own native dishes and your blog and a couple of others have still allowed us to eat very well. I am very thankful that you record your recipes meticulously and share them in such a well organized space. I wish you a very Happy Lunar New Year! Aww I’m so happy to hear all that! I love your boys for loving dubu jorim and and gamja jorim. 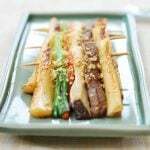 I agree doenjang guk can be good without meat. Thank you so much for trying out all those recipes and for the nice words! 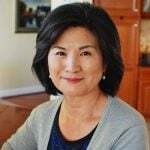 Let me know how your kimchi turn out. Happy Lunar New Year to you and your family as well! It’s so smart and appetizing! Don’t know the Korean food but it’s worth to be known! Thank you! Hope you get to try it one day.